NEW DELHI: For long, Pakistan has accused India of fuelling rebellion in Baluchistan. India has vehemently denied any involvement, though it has in recent past and on Monday made statements against Pakistan’s suppression of the rebels. Pakistan accuses India of using its missions in Afghanistan to train Baluch rebels and arming them. India has reasons to fuel trouble in Pakistan’s biggest province: in the short-run it would keep Pakistan engaged and troubled, and would stymie its ability to focus further on Kashmir. It looks perfectly like the South Asian dog-eat-dog world of counter-intelligence and covert operations. There has never been any credible evidence to prove Pakistan’s claims, but there is no reason to believe Indian agencies are not interested in Baluch rebels. It is a fact that India for long has been closely watching the situation in Baluchistan due to its strategic location. Not just Pakistan’s richest region in terms of natural resources, the tribal land is also where many of Pakistan’s strategic assets are located. Trouble there should be gladdening to majority in the Indian strategic community who are steeped in the Partition mindset. 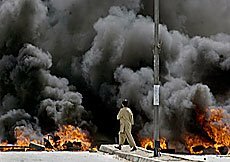 A troubled Baluchistan, which it is presently, would be of serious concern to Pakistan. That is where its biggest port project is underway. The Gwadar port, being built with Chinese assistance, would not just be Pakistan’s biggest seaport but also its most important location for naval assets in future. Gwadar is on the southwestern coast of Pakistan, next door to the Strait of Hormuz, a major sea-lane for oil and other cargo. Chagai Hills, where Pakistan conducted the 1998 nuclear tests, is in north-western Baluchistan. The killing of Nawab Akbar Khan Bugti could have serious long-term repercussions not just in Baluchistan but across South Asia. In Baluch a new martyr is born. Across South Asia, the tremors of a possible redrawing of national boundaries can be felt again. The possibility of Baluchistan disintegrating are distant, but it cannot be ruled out. Given its strategic location and interest of various groups including the Americans in Baluchistan only adds to the possibility of the rebellion remaining robust into the future.